I’m not sure why Ireland feels so magical, but it does. Perhaps it’s the thousand permutations of green from emerald to shamrock to kelly green. Or the fairy houses found in many woods and glens. Or the music in everyday life, from fiddlers in the pub to the lilting sounds of Gaelic. Whatever, come with me on this short trip from the capital of Dublin through Counties Waterford and Kerry, and feel the magic. Early morning in Dublin. Just arrived. Along the River Liffey. St. Stephen’s Green Park, in Dublin, Ireland. Green, indeed. Sunny, too. Spotted in the Wicklow Heather Restaurant: a letter the Irish writer James Joyce sent to his wife. “Dear Nora, I have just this minute returned from Trieste. I am burning to see you.” Does anyone write letters like that anymore? It was a grand, soft day, as the Irish say. Saint Kevin of Glendalough wandered this area in the 6th century and established a monastery, now in ruins. The famous ascetic lived in a cave and supposedly hid from women who tried to seduce him. There’s a song by the Dubliners about him. Wicklow County, Ireland. What sport does this man play? The game is about 3,000 years old; it’s considered the world’s fastest field sport; the current all-Ireland champ is Kilkenny, which beat Tipperary; rhymes with “curling.” Answer: hurling. My address for the night, Lismore Castle, in County Waterford, rebuilt in the 19th century and owned by the Duke of Devonshire. The house is rentable for gobs of money. My room is decorated with 17th-century Flemish tapestries, heavy brocade curtains, a claw-foot rub, pull-chain toilet, and a Narnia-worthy armoire. The view from the loo of my chamber. Brilliant! Tower Room, Lismore Castle, County Waterford, Ireland. Canoeing on the River Blackwater, County Waterford. It seems I’ve walked into Downton Abbey, and luncheon is served. While this particular castle—Lismore, in County Waterford—is a bit spendy for most of my friends, Ireland is dotted with castles and stately homes, called “Big Houses,” many reasonably priced, which one can book by the room. Wee Irish laddie, apple-eating and apple-cheeked. Lismore Castle, as the rain clouds roll in. The castle gardens are open to the public. County Waterford, Ireland. The plan for a walk on the Iveragh Peninsula, replete with heady vistas, including of the craggy Skellig Islands, which house 1,500-year-old early Christian monastic ruins. Cemetery by the sea, County Kerry. That’s the Celtic Cross in the center. And the inscription says “Rest in Peace” in Irish. Do you believe in magic? The Irish still do. 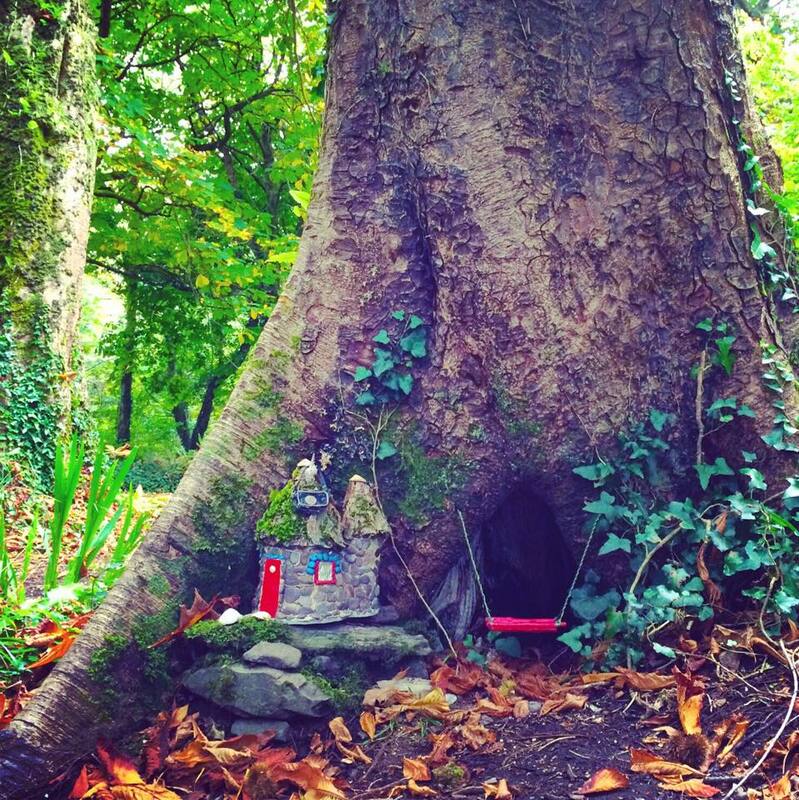 Amongst the historic gardens of Derrynane near Caherdaniel in County Kerry, live about 20 fairy families. Spot their houses in the wood. One of them even has a jacuzzi. The quality of light here is strange and sumptuous. Blurry image taken through the window of a bus on the R565 enroute to Valentia Island. This is part of the famed Ring of Kerry. Southwest Ireland. 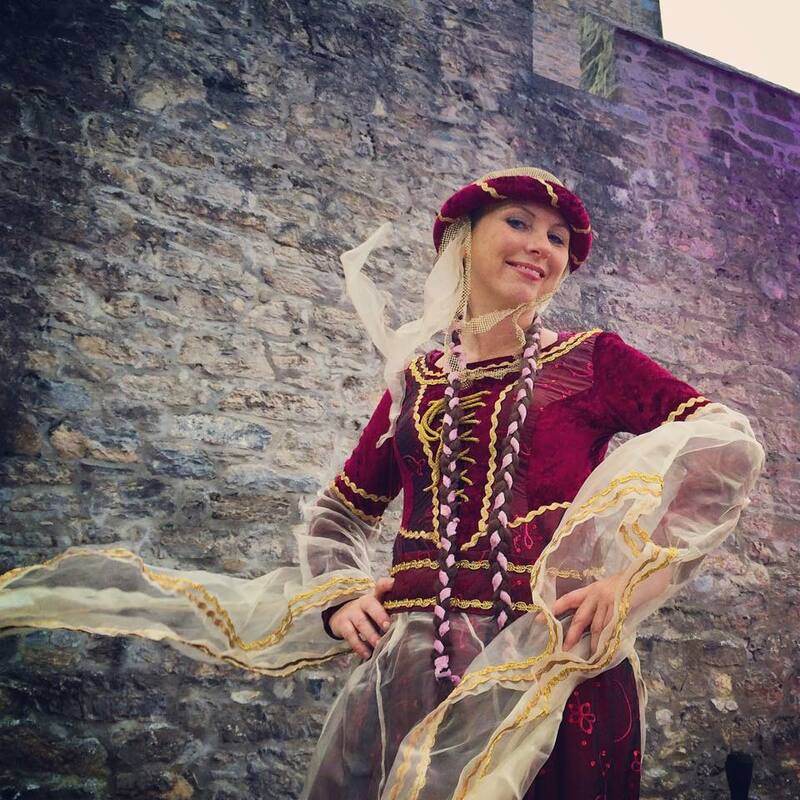 Courtly welcome at the 15th-century Ross Castle, ancestral home of the O’Donoghue clan, in County Kerry. A performance among the 7th-century early-Christian abbey ruins on Innisfallen Island, now part of Killarney National Park. The monastery was used for 850 years and Ireland’s last and only king, Brian Boru, studied there. Remember his name: Big Hollywood movie supposedly with Colin Farrell playing the king, hits the screen in 2015. There’s an Irish redhead on my boat on Lough Leane, one of the three lakes in Killarney National Park. That’s Ross Castle in the distance. Signs and ads for Guinness, sometimes called Irish Mother’s milk are ubiquitous throughout Ireland. (This one is a vintage reproduction.) There was a time when pregnant women were told to drink a glass of Guinness a day for their health and the health of the baby. I have to say, a well-poured pint of the good stuff is good stuff. Only 144 people a day, for only 90 days a year, are permitted on Skellig Michael, off southwestern Ireland. The crossing to get there can be rough and the island inhospitable and fragile. But this UNESCO world heritage site is worth the hassles. Early Christian monks 1500 years ago and over centuries built a monastery on this rock. To see what they accomplished in such difficult conditions is inspiring. And climbing hand-built rock steps at the edges of cliffs makes for an epic Stairmaster workout. The island in the distance is Little Skellig, home to one of the largest colonies of gannets in the world. Beehive structures built by early Christian monks 1,500 years ago on Skellig Michael, a rocky outcropping and UNESCO World Heritage Site off southwestern Ireland. It makes its Hollywood debut in the upcoming Star Wars Episode VII movie. There's a recently decommissioned lighthouse on Skellig Michael. Planners are looking into the possibility of renovating it to house up to 8 overnight guests to this UNESCO World Heritage site. In the meantime, it sits, dank and derelict, with a few reminders of former occupants--clearly lonely—including a shortwave radio and a copy of E.L. James’s Fifty Shades Darker.